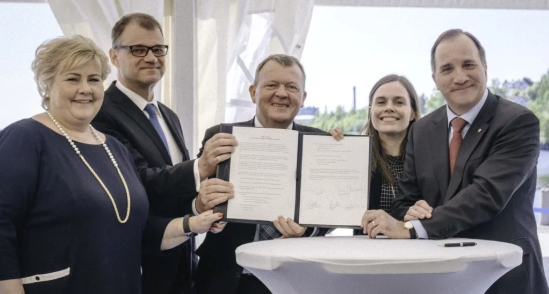 All five of nations in the Nordic region have signed a Letter of Intent, favouring regional collaboration to launch a leadership bid in the 5G rankings. The letter itself was signed in Örnsköldsvik in Sweden at the annual two-day meeting of the regional leaders, with each Prime Minister committed to the collaborative dream. It’s an approach which hasn’t really been seen elsewhere, passive aggressive comments seem to be the speciality for 5G, but considering the relatively small size of the economies and populations in the five countries, pooling resources and objectives does seem like a sensible move. The prime minister signatories are: Stefan Löfven (Sweden), Erna Solberg (Norway), Lars Løkke Rasmussen (Denmark), Juha Sipilä (Finland), Katrín Jakobsdóttir (Iceland). The letter itself agrees to set up a common action plan addressing the development of testing facilities and test beds, technical coordination of 5G frequency bands within the region and the removal of obstacles to expansion of the 5G network, in particular deployment of base stations and antennas. More specifically, transport, mission critical communications, smart manufacturing, energy and agriculture are the targeted segments. As an idea, it is certainly a sound one. Getting 5G right is certainly going to be a costly investment and achieving economies of scale will be critical to ensure an effective experience. However, balancing the needs of the individual countries against the greater good of the region will be a tricky task. Sacrifices will have to be made, and could be the deciding factor as to whether this nice idea becomes a reality.